If you’re planning to visit Rio de Janeiro for the 2016 Olympics in Brazil, you may also want to head out of the City for a few days. That’s just what we did this summer (albeit their winter) with two very different attractions: Paraty, a 4 hour drive in lush scenery known as the Green Coast (Costa Verde) south of Rio; and Buzios, a beach and nightlife Brazilian favourite, about 2 hours drive north if the roads are clear. 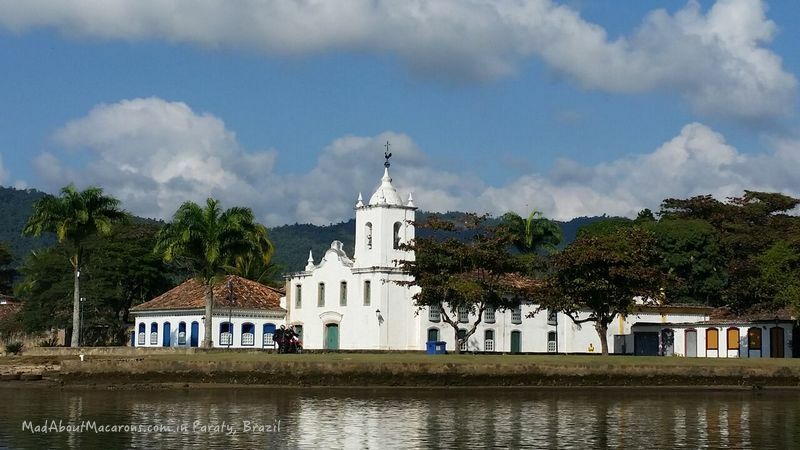 Paraty is a beautifully preserved Portuguese Colonial town dating from 1667 which served as a thriving port to export gold, coffee and sugarcane in the form of the local spirit, Cachaça. As the railway was built in the 19th century for cheaper transport to Rio and the gold ran out, the town was almost abandoned, hence such a wonderful conservation of the old town for about 250 years. 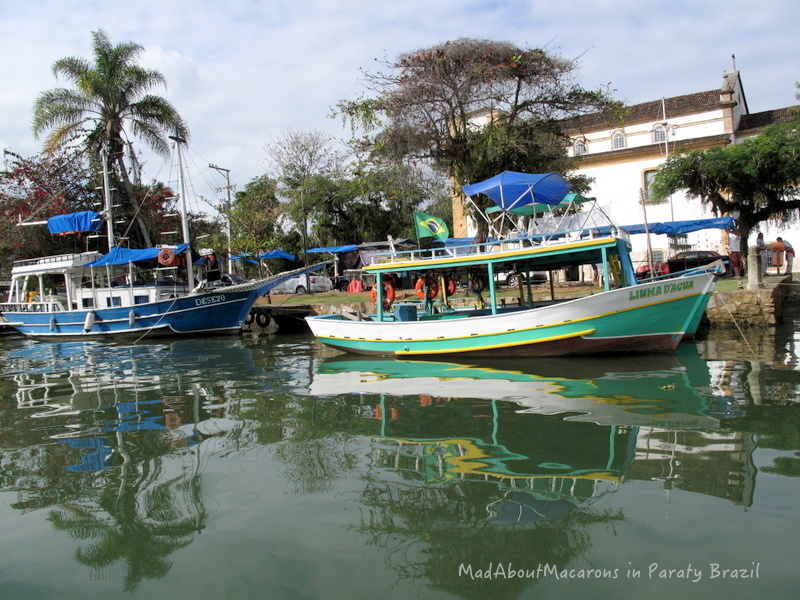 Since the 1970s the fishing town of Paraty has been rediscovered as a thriving tourist destination. 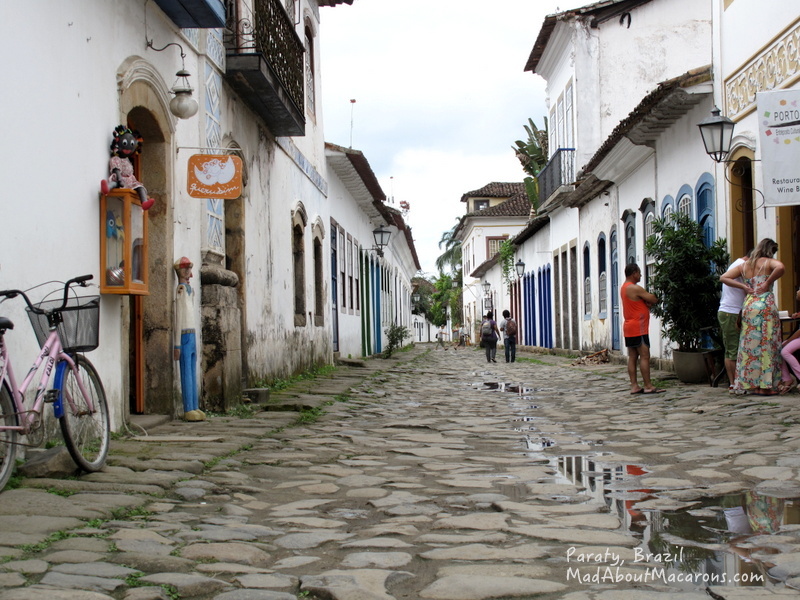 Paraty is also known for its uneven cobblestone-paved streets in the historical pedestrian centre.It hadn’t rained when we arrived: instead the water collecting in the stones was a sign of the tide gradually pouring in to this part of town as full moon approached. By the time we had left, these streets would have been flooded – something the locals are used to each month but it’s nothing much and doesn’t last long. 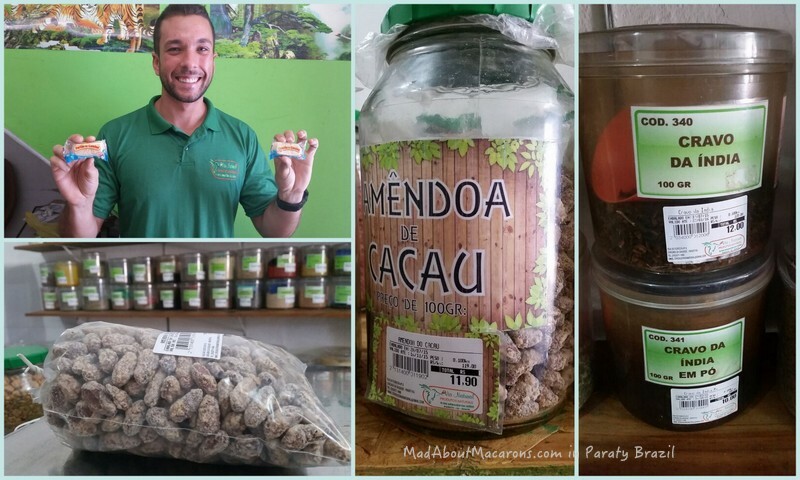 One of the first things that struck us were the number of brigadeiro stalls, where the locals were enjoying their sweet fix at teatime – and in the mornings and evenings too! It’s the first time I’ve seen poinsettias growing as bushes. Somehow my miserable poinsettias that I try to look after at Christmas time look miserable in comparison! We had some fun on Facebook, guessing what was this side dish below. They’re palm hearts, something that we often serve in French salads but they’re conserved in tins, long and thin. These enormous disks were fresh from the top heart of the palm tree, baked in the oven and served with a dribbling of olive oil. 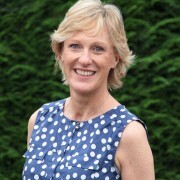 There are plenty of wonderful restaurants to choose from – mainly serving excellent fish. 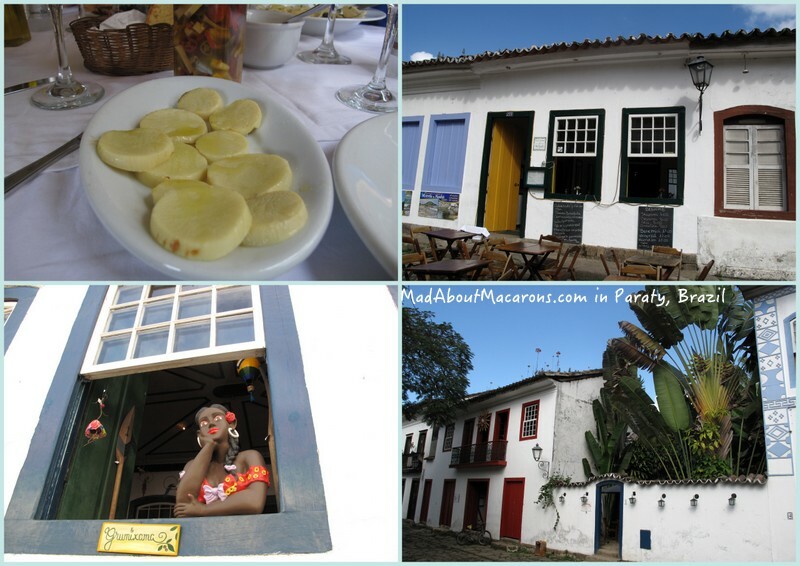 Our favourites were Banana da Terra and that of the Pousada Literaria where we were staying. Perhaps the most wonderful of breakfast specials was their cheese waffles with honey and rosemary. I managed to develop a recipe for you back home with the ingredients we find in Europe (it ended up being gluten free) – here it is! I do hope you try this cheese waffle recipe. 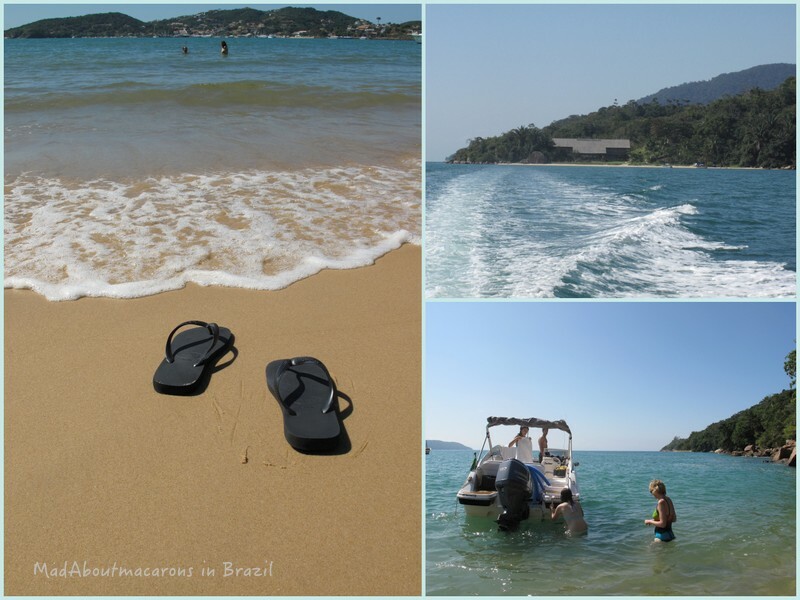 To appreciate the inviting islands dotted all around Paraty, you must take a boat ride. 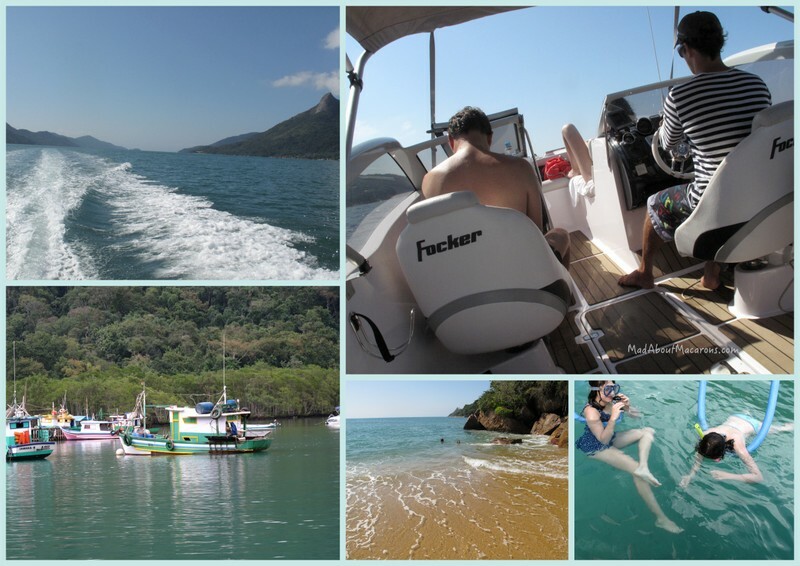 We were in the expert hands of Davi Trinidade, our Captain for the day with his speedboat Palombeta. 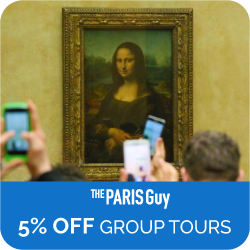 I had previously booked our 5-hour day trip online on his site, which is very clear and efficient – and was so impressed that we booked a second day with him! And discover paradisiac strips of beach with either smooth sand or finely crushed shell, go swimming and snorkelling. Don’t ask me why, but I still can’t get that mask on my face – so my excuse was to take the photos! Meet the Fockers for the day! 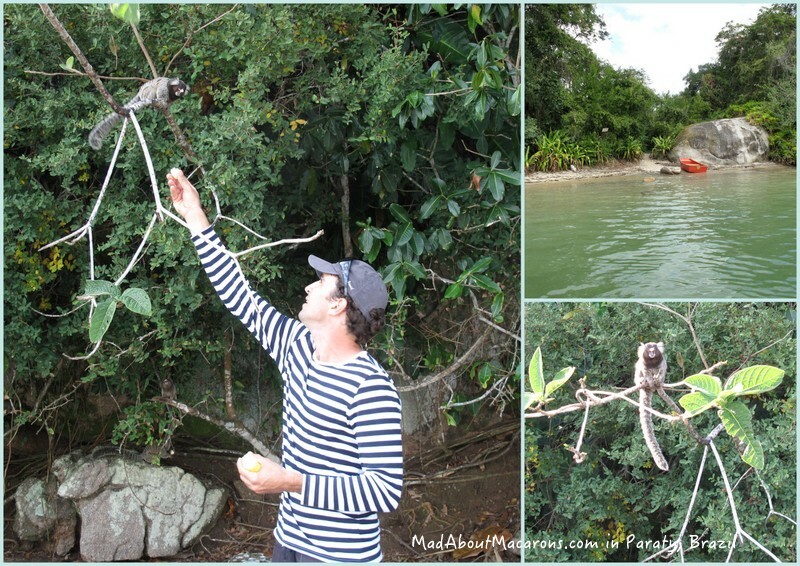 The highlight for the girls was watching the turtles then feeding the monkeys on Monkey Island. These cuties would gently hold your finger as they politely took some banana. Well raised little monkeys indeed! Their miniature faces were captivating. Davi’s English was perfect and took his time with us ensuring we enjoyed every moment, including a stop off for lunch. 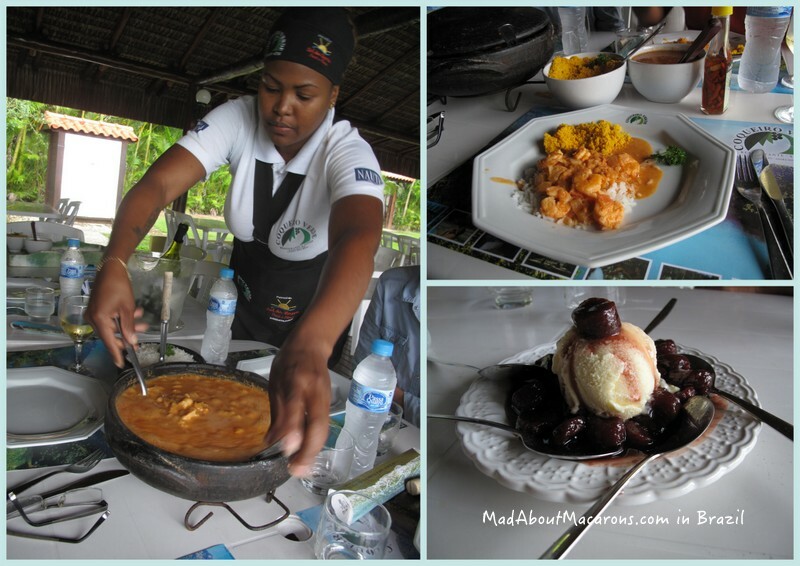 A typical dish served here is a traditional prawn or fish stew, Moqueca, served in a hot clay pot. I tasted a few to try and each one was quite liquid. It’s served with a typical side dish of Farofa – a combination of manioc flour with some sort of fat or oil to give it a sandy texture – gravy from the stew and chilli oil to taste. This vanilla ice cream dessert looks like it’s served with cherries, right? Instead it was candied bananas, absolutely delicious. 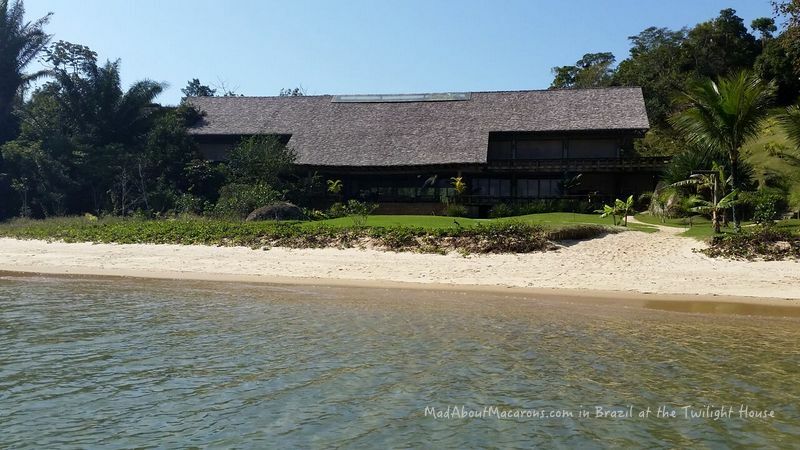 Davi anchored in front of this thatched roof villa with its private beach. Antoine and I were totally out the cut but the girls were enthralled to hear that this was the famous house filmed in Twilight. The island of Esme, where the couple honeymoon in the saga Breaking Dawn, doesn’t exist. 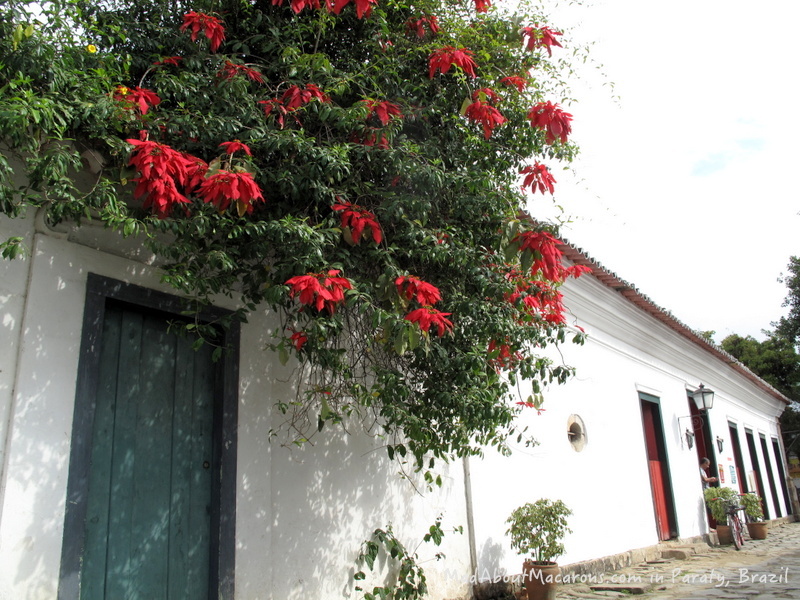 It’s here in Casa em Paraty, which can be rented – perfect for vampire honeymoons, I hear. 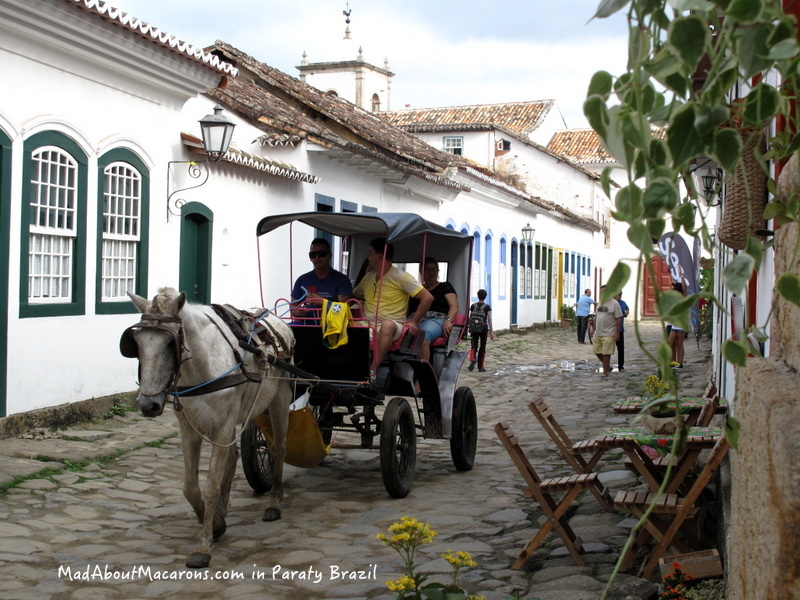 Back on Paraty land, another popular form of transport is by horse-drawn carriage. 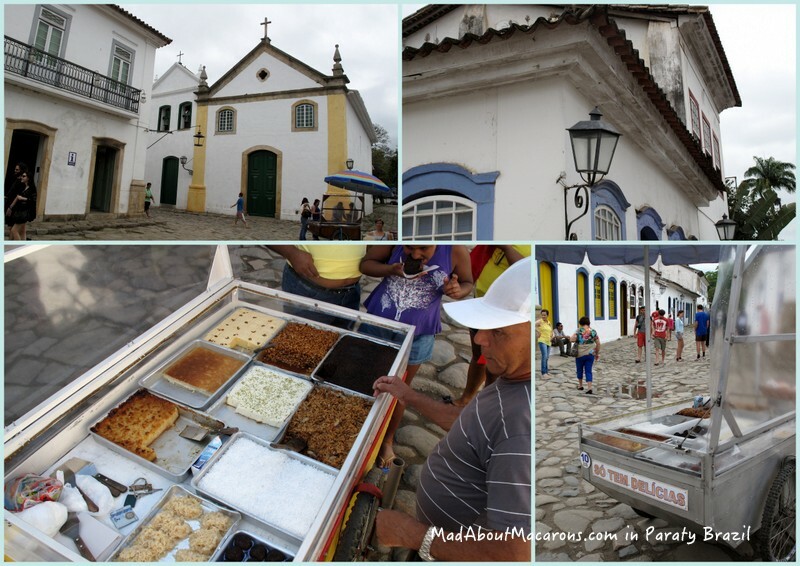 No visit to Paraty is complete without a taste of the local speciality made famous here since the 19th century. Cachaça is a sugarcane-based spirit which is the main ingredient for the Brazilian cocktail, Caipirinha. The classic cocktail was with plenty of limes but we also adored the fresh passion fruit version too at apéritif time – a great excuse to celebrate our 18th wedding anniversary, which we just about totally missed if we hadn’t seen a message from Mum and Dad! 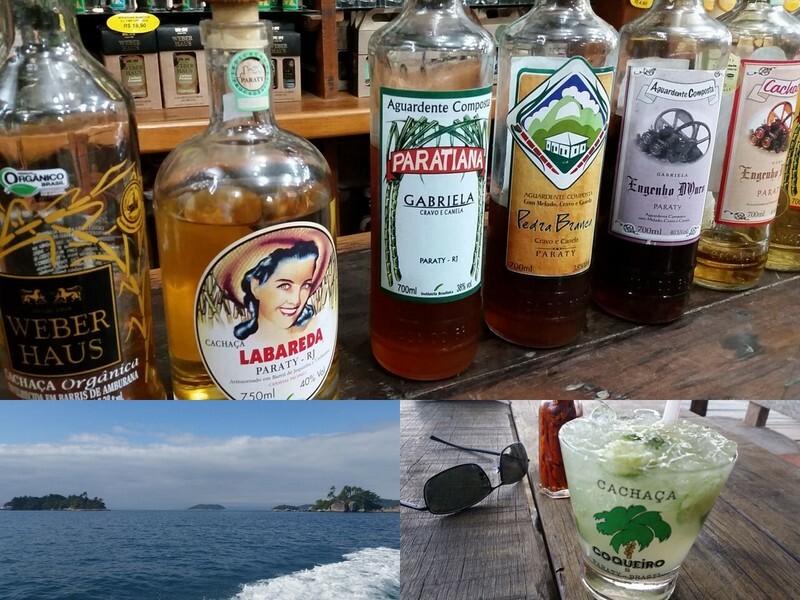 A century ago, Cachaça was called Parati, hence such a famous location for the best in Brazil. 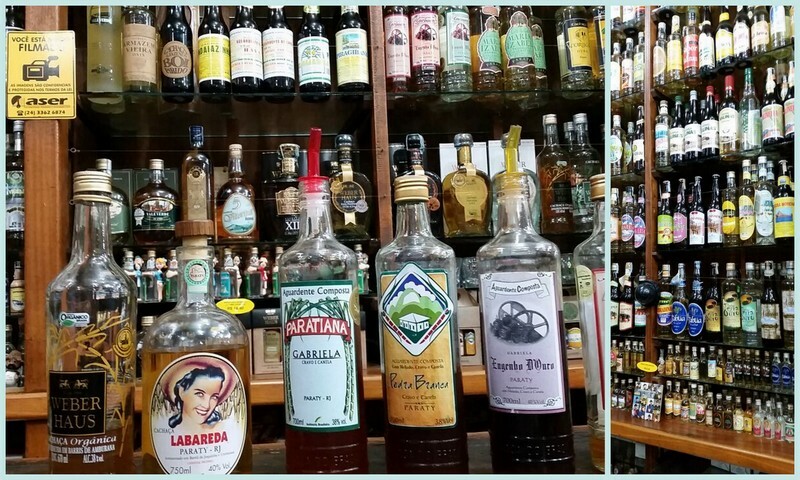 After a tasting, my best Cachaça friend was definitely Gabriela, discovered at the main store in Rua do Comercio. She’s a spicy number with cinnamon and cloves. Add this to a Caipirinha and the evening is sure to start off the festivities! André couldn’t let us leave without trying Açai (ah-sah-ee). This super-healthy but bitter berry is found around the Amazon river basin and is hugely popular in Brazil. As a drink, it’s sweetened normally with banana but André had a wonderfully vibrant Açai powder which I look forward to using – particularly as it’s list of health benefits is well worth the try. I’ll experiment with it for some pastries at teatime but in the meantime, I’ve already made a Brazilian version of breakfast granola using the above ingredients. Fabulous! 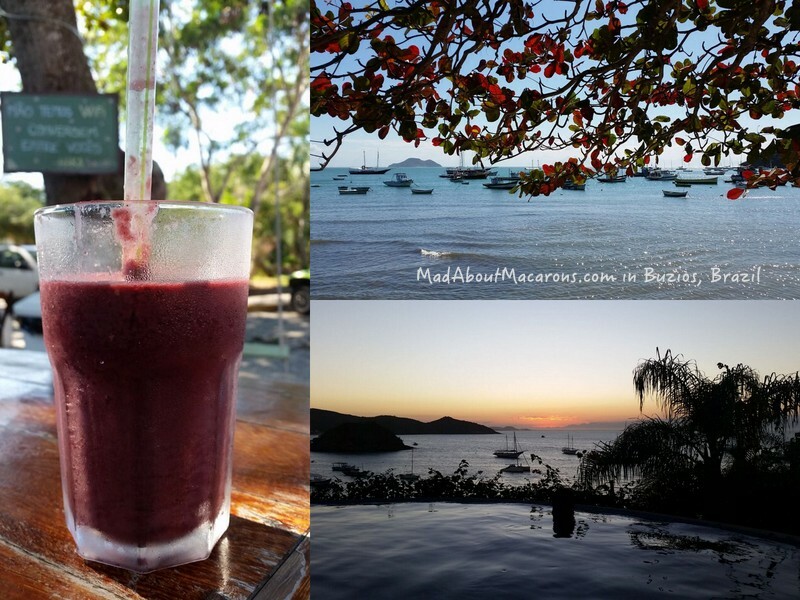 I’ll finally leave you with a sunset from Brigitte Bardot’s beach in Buzios, the “Saint Tropez of Brazil”. Cheers to you, readers! Now I’m finally back in Paris, you may have noticed I’ve been travelling again since Brazil. Next stop on le blog? The Loire Valley.